In an attempt to improve the previously reported 64 % yield of the L-cysteine S-glycoside 4, a 2-fold excess of 1,2,3,4,6-Penta--0-acetyl-/3-D-glucopyranoside 1 was used in the glycosylation of N-acetyl-L-cysteine. However, a previously unreported cysteine-bridged dodisaccharide 6 was isolated in 54 % yield instead of the target L-cysteine thioglycoside 4 (Scheme 1). 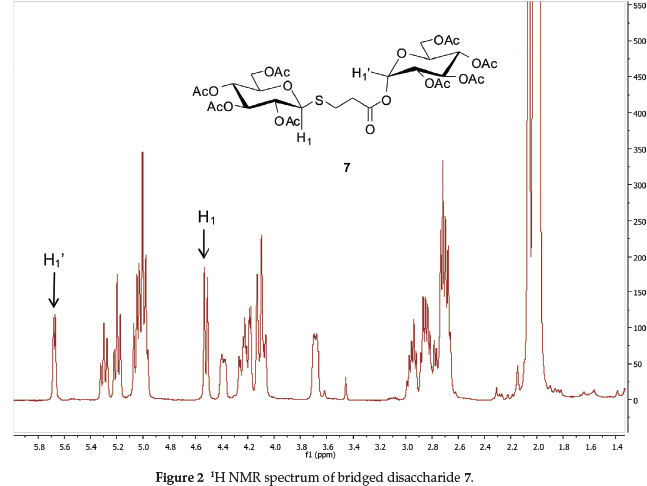 The presence of the cysteine-bridged disaccharide 6 was indicated by the presence of two anomeric protons at d 6.27 (d, J = 3.6 Hz) and at d 4.51 (d, J = 10 Hz) in the 1H NMR spectrum (Fig. 1). The downfield doublet at d 6.27 is due to the proton on the acyl glycosylated anomeric carbon and the small coupling constant of 3.6 Hz confirms the a-stereochemistry at this end of the molecule. Furthermore, the upfield doublet at d 4.51 with a large coupling constant of 10 Hz is typical of a thioglycosydic bond with ab-stereochemistry. 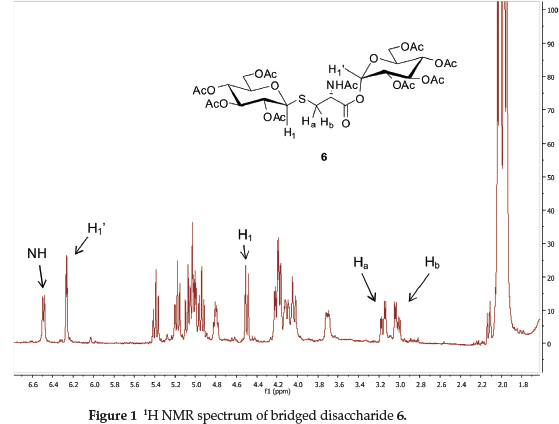 Other key signals in the 1H NMR spectrum of 6 are: d 6.50 (d, 1 H, J = 7.6 Hz) for the cysteinyl NH which was assigned on the basis of HMQC data, which shows that this proton does not correlate with any carbon and the COSY (H-H) which shows that this proton is only coupled to the methine on the a-carbon of the amino acid residue at d 4.81 (m, 1H). The 13C NMR spectrum displayed diagnostic signals at d 90.3 ppm and d 83.3. The identity of 6 was also confirmed by HRMS which showed the protonated parent peak at 824.2268 (calculated 824.2283). It was also important to establish whether the acetamido group on cysteine which affects the pKa of cysteine (pKa = 3.24 compared to 4.34 for 3-mercaptopropionic acid) has any role to play in the formation of 6. Thus, 3-mercaptopropionic acid 3 was glycosylated with 1 in the presence of SnCl4 in dichloromethane at room temperature (Scheme 2). The results of this reaction showed that the product formed depended on whether an excess amount of the donor was used or not, and not on the pKaof the mercaptopropionic acid used. When excess donor 1 (2 equivalents) was used, the 3-mer-captopropionic acid bridged disaccharide 7 was obtained as a sole product in 52 % yield. The formtion of 7 was supported by the presenceoftwo anomeric protons at d 5.65 (d, J = 5.6 Hz)and d 4.50 (d, J = 9.6 Hz) in the 1H NMR spectrum (Fig. 2). The downfield signal at δ 5.65 (d, J = 5.6 Hz) is due to the proton on the acyl glycosylated anomeric carbon and the small coupling constant (J = 5.6 Hz) confirms the a-stereochemistry at this end of the molecule (Fig. 2). The high field doublet at d 4.69 (J = 9.2 Hz) is due to the thioglycosidic anomeric proton and the large coupling constant confirms the β-stereochemistry at this end of the molecule. Furthermore, the 1H NMR spectrum displayed a multiplet at δ 2.91-2.64 for the four methylene protons on the mercaptopropionic acid link. The 13C NMR spectrum displayed diagnostic signals at á 83.9 and á 82.7 for the two anomeric carbons. The identity of 7 was also confirmed by HRMS which showed the protonated parent peak at 767.2037 (calculated 767.2024). In order to establish the mechanism of formation of these pseudodisaccharides, and specifically the order of glycosylation, model reactions were set-up: when cysteine thioglycoside 4 was glycosylated with 1 in the presence of SnCl4 as a promoter, no glycosylation product was detected. This is in line with earlier observations that cysteine glycosyl esters are difficult to form under mild conditions. Furthermore, the glycosylation of S-pro-tected S-benzyl-N-acetyl-L-cysteine with donor 1 under similar conditions failed to form any glucosyl ester. This result was not unexpected because it has been shown that glycosyl esters are difficult to form when the donor does not have a more labile leaving group at the anomeric centre of the donor.10,11 These results suggest something unique is happening in the milieu of the reaction and we are currently performing further experiments to establish the exact order of events during the formation of these bridged disaccharides. Overall, the formation of pseudodisaccharides 6 and 7 depend on the reaction conditions: when excess donor is used, both the sulfyhydryl and the carboxylic acid groups react to give a unique mercaptopropionic acid-bridged glycopeptide structure. These bridged disaccharides have two glucose units, one linked in an a-configuration via the acyl group and the other linked in a b-configuration via the sulfhydryl group. On the other hand, when the mercaptopropionic acids are used in excess, only the thioglucosides 4 and 5 are formed. Furthermore, we conclude that the acetamido group on L-cysteine, which affects the pKa of cysteine (pKa = 3.24 compared to 4.34 for 3-mercaptopropionic acid), has no role to play in the formation of the bridged disaccharide since 3-mercaptopropionic acid reacts in a similar manner to N-acetyl-L-cysteine. The reaction described herein represents the first reported case of a one-pot, sequential installation of two sugar units in different anomeric configurations, with one a thioglycoside and the other an acyl glycoside. We are currently conducting further experiments to elucidate the mechanism by which these pseudodisaccharides are formed. All reactions were carried out under an inert N2 atmosphere. Dichloromethane was dried by distilling from P2O5 and all commercially available reagents were used without further purification. Reactions were monitored by TLC using Silica gel 60 UV254 (Alugram) pre-coated silica gel plates; detection was by means of a UV lamp and by heating the plate after spraying with a solution of Ceric ammonium sulfate (CAS) [Preparation: 63 g CAS dissolved in 500 mL of 6 % H2SO4 and diluted to 1 L mark with distilled H2O]. Organic layers were dried over anhydrous MgSO4 prior to evaporation on a Buchi rotary evaporator B-490 with a bath temperature of 40 °C. Column chromatography was carried out on Machery Nagel silica gel 60. IR spectra were recorded on a Perkin Elmer UATR Spectrum Two spectrophotometer. 1H and 13C NMR spectra were recorded on Varian Gemini 400 at ambient temperature, in CDCl3. The splitting patterns are reported as follows: singlet (s), doublet (d), triplet (t), doublet of doublets (dd), multiplet (m) and broad singlet (br s). Mass spectra were obtained on a Waters Synapt G2 mass spectrometer. We acknowledge the institutional and financial support of the Tshwane University of Technology and the financial support from the National Research Foundation (NRF-South Africa) for Thuthuka Grant for Researchers in Training (GUN 66173) to MGN and Human and Institutional Capacity Development Programmes grants (IRDP GUN 62464) to CMN.